Before I moved, I had vigorously tested two recipes and photographed them to my liking so that all I would have to do is write up something and then have it scheduled to post prior to my move so that I could just close my computer and focus on work and packing. 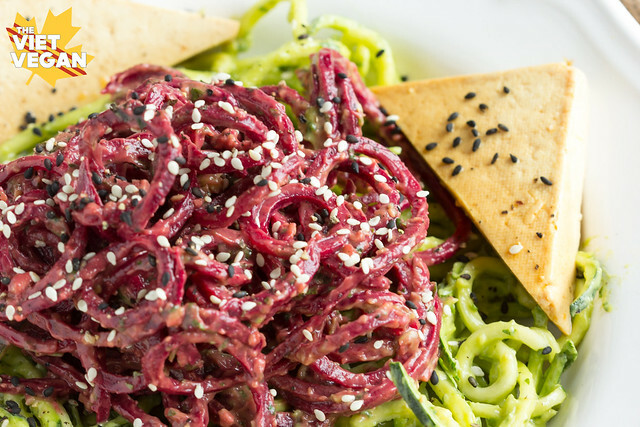 I can hardly take credit for the beautiful movement and texture of beet and zucchini pasta, but the crunch paired with the bright and creamy avocado dressing was wonderful for the hot days prior to my move. The marinated tofu is the perfect texture and has just the right amount of salt and flavour. 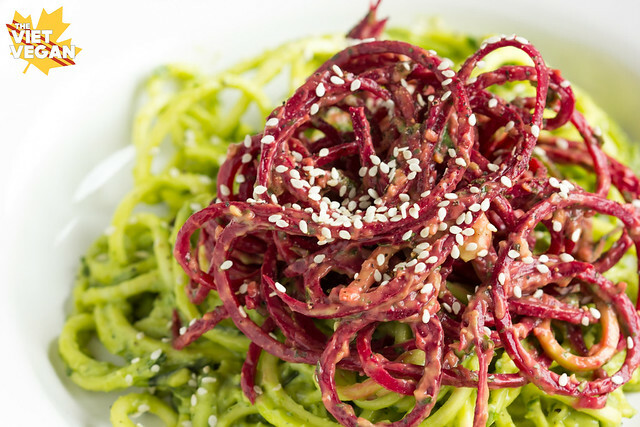 I was so excited to share this zucchini beet noodle with avocado cilantro lime sauce recipe with you last week—I patted myself on the back for my advance preparation and forethought, but as life would have it, it threw some other stuff in my direction and I lost control. No words came out of my fingers for this post. I’ve always prided myself as someone who is very level-headed and down-to-earth. Often, I over-rationalize things and a fault of mine is to always blame myself or put the onus on me for things that have happened—things I’m told that are out of my control. I’m learning that a lot of the reactions and decisions I’ve made in my life are because of the need for control in this unpredictable world. I have a feeling that my ezcema and scratching is aggravated by my desire to be in control, and scratching an itch is the ultimate form of control—action then gratification. Only, then I’m left with pain, scars, and a sense of shame. Another example is my approach to conflict. I systematically identify the issue, propose a solution, execute that solution, and then evaluate the end result. This often involves a lot of frank and open discussion. And because I dislike conflict, I try to resolve all issues as quickly as possible. Not everyone works at the same pace as me, and some of the issues in my life recently have been a direct result of me trying to force people and things to keep up with me. It’s taken incredible self-control to let go of the reigns and let things happen at their own pace. I’m trying to relinquish my need for control and find the underlying issues that make me so neurotic about it all, but it’s been hard. With everything going on, I feel like it’s an uphill battle, and all I can do is make my bed and relish in its innate order and balance and hope that feeling will seep into the rest of my day. The past three days have been full of unpacking boxes and trying to find homes for all the things, but I feel incredible peace and satisfaction when I close the cupboards, knowing where everything is and that everything has its place. Then I look at the sea of boxes that have yet to be unpacked, a sea that’d be much more daunting if it weren’t for my friends and family who’ve been here helping me unpack and organize. I’ve been here for only three short days, but already I’m learning so much more about myself than I have in a long time. Something about living on your own and noticing that yes, I do indeed need support is a surprisingly empowering feeling. I know now who I can count on in my life, and it’s incredible to feel this much love from the people I’ve surrounded myself with. I’ve already written a novel of a Facebook post on my personal profile to say thank you to those who’ve helped me with my move, but essentially I have so much gratitude for everything and everyone in my life right now. Thank you to everyone in my life who’ve shaped me into the person I am today. I have so many plans and goals for the future and I can’t wait to get the ball rolling. First things first, get totally unpacked. Then, adjust to the new environment and dust off my camera. Wrap tofu in kitchen towels or paper towels and press between two flat surfaces with something heavy like a textbook or canned beans on top. 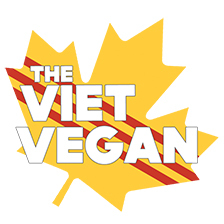 Let the tofu press for at least 30 minutes. Meanwhile, prepare the marinade by mixing tamari, apple cider vinegar, maple syrup, ginger, and water. Prepare the tofu by cutting the block into 3 flat slabs (cutting them lengthwise), then cut those slabs in half widthwise. Cut them diagonally to make triangle steaks. Let them sit in the marinade for at least an hour to soak up the flavours. They're best made by leaving them in the marinade in the fridge overnight. 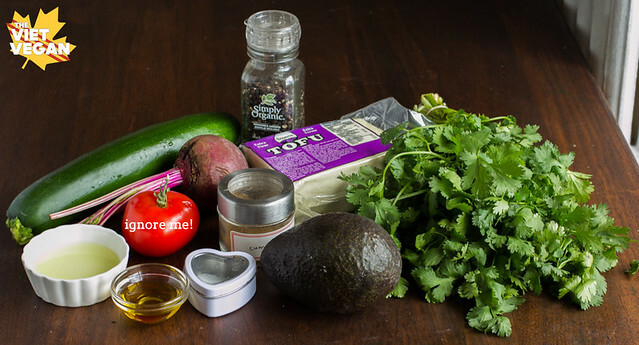 Combine avocado, lime juice, olive oil, garlic, water, cilantro, black pepper, and cumin. Set aside. 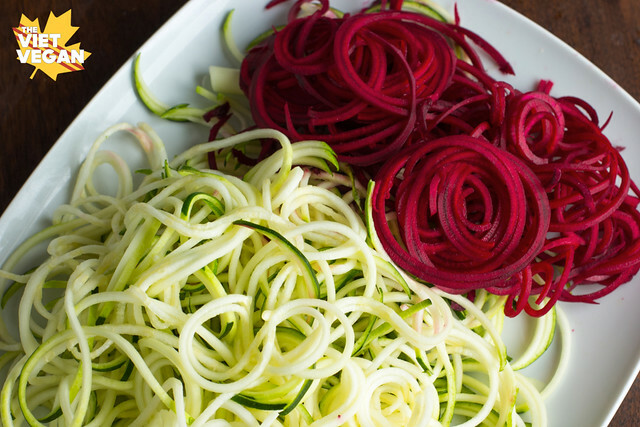 Make the zucchini noodles using a spiralizer. You could also use a mandoline slicer to cut them into long strips or julienne to make this into more of a slaw. In my photos, I combined the beets and sauce separately from the zucchini and sauce, but that was more for aesthetic. Feel free to do the same or simply toss everything together. Top with the marinated tofu steaks (you can grill them for a charred flavour, but I love eating them cold). 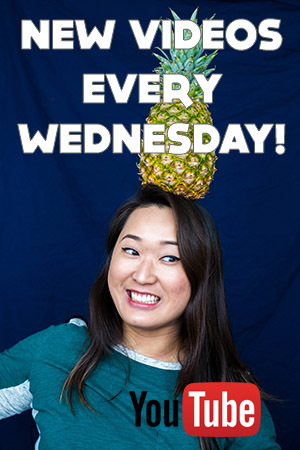 Garnish with more chopped cilantro, and some sesame seeds if it suits your fancy. While I loved the combination of zucchini and beets, I found the avocado sauce had a bite to it from the garlic. (and I love garlic.) Because the other favors are so mild, I would recommend only 1 clove of garlic. The avocado sauce is deliciously creamy and coats the vegetables nicely. 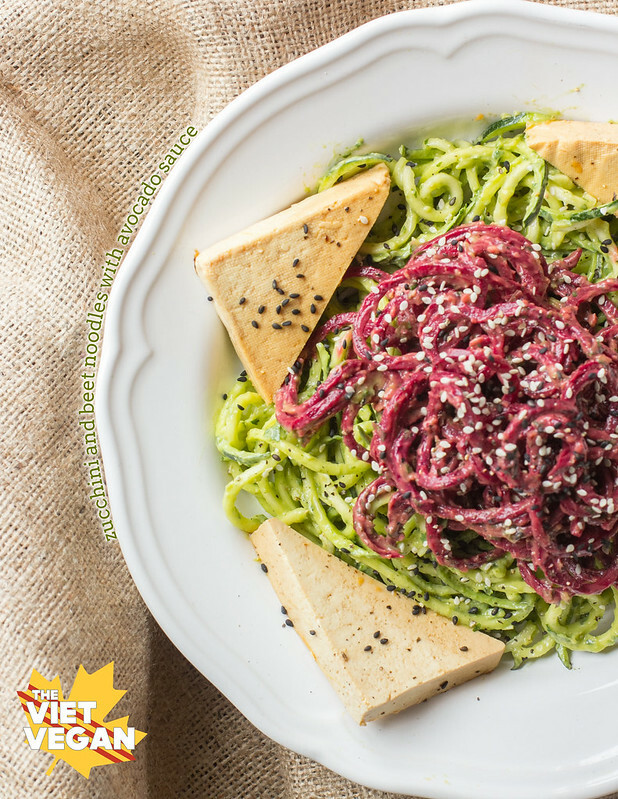 Do you cook the beet noodles at all or just toss with the sauce? My husband just surprised me with an automated spiralizer... so I am gonna try out your recipe one day. Loved reading this btw. Love your realness.